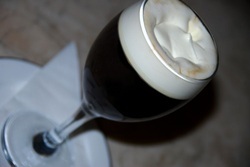 Many people enjoy an occassional Irish Coffee, say after a meal and instead of dessert. With a bit of practice they are easy to make. Follow our recipe and method cafefully and you will have a perfect and dangerously moreish Irish Coffee to enjoy! If you are serving your Irish Coffees after a dinner and you have a guest or guests who don't drink alcohol, you can make "mock Irish Coffee" simply by leaving out the whiskey. They still get served a delicious coffee and are not left out. 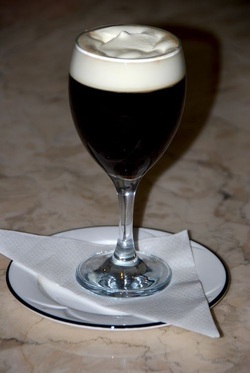 "Only Irish Coffee provides in a single glass all the four essential food groups: alcohol, caffeine, sugar and fat." (Author unknown). 1. Make a jug of coffee. You can use either filter coffee or instant coffee. 9. Turn heated spoon with curve upwards and lightly touch the side of the glass at the level of the liquid.